Nov 12, 2015 | By CENS | AEON LIGHTING TECHNOLOGY INC.
ALT's high-power drivers for LED lamps. Aeon Lighting Technology Inc. (ALT) promoted a number of striking products at the HKTDC Hong Kong International Lighting Fair (Autumn Edition), held Oct. 27-30, among which included the Zenus series drivers for high-power LED lights, the Theseus series anti-explosive LED lamps, and its high color-rendering-index (CRI) commercial lights. The Zenus drivers are rated 12W-500W in power consumption, available for various brands of LED lamps and lighting controllers integrated with Digital Accessible Lighting Interface (DALI) protocol. Built with Japanese-made components, the drivers are designed to withstand voltage surge up to 20KV and freezing temperatures ranging -25C to -60C. Pointing out the superiority of the drivers, James Huang, assistant manager of ALT's sales department, said that drivers available on the market now typically withstand maximum voltage surge of 10KV. Huang also pointed out the company's marketing strategy for its drivers that is based on stressing the considerable number of patents won, that drivers account for nearly half of the 37 patents the company has so far won with lighting products. These patents prove also the most notable feature of the drivers: durability, which is backed by a three-year warranty. 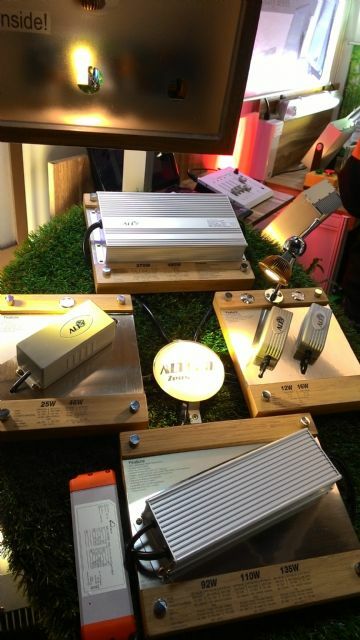 Founded in 2007 as a leading supplier of high-power LED lights in Taiwan, ALT has not promoted its drivers, which are specifically for lighting, as an independent product line until this year. ALT's anti-explosive lamp won two awards in the “My Favorite Lighting Products” competition of the lighting fair. The lamp has been verified by ATEX and IECEX, the world's top-two organizations for testing explosion-proof equipment, which has shown that the lamp will not let in smoke even if subjected to TNT explosion. Of one-piece construction, the lamp is rated IP68, the highest grade in Ingress Protection Marking. The company's high CRI commercial lamps are designed to make apparels in stores look more vivid in color with the 90-plus CRI.